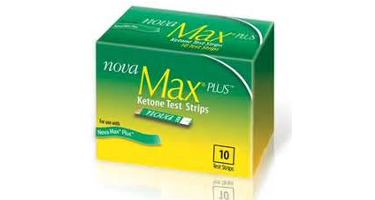 NovaMax Ketone Test Strips are designed for use with the NovaMax Plus monitor. NovaMax Ketone Test Strips measure ketone levels in blood with a very small sample, just 0.8 microliters. Results are available in only 10 seconds. The American Diabetes Association recommends blood ketone testing whenever the blood glucose level is >250 mg/dL or during sick days. One box of ketone strips contains 2 vials, each with 5 test strips. Nova's ketone test strip provide a 2-year shelf life from the date of manufacture. The test strip vial can be stored in the NovaMax Plus carrying case so that ketone strips are readily available. A pamphlet explaining ketone test results is included in each test strip box.